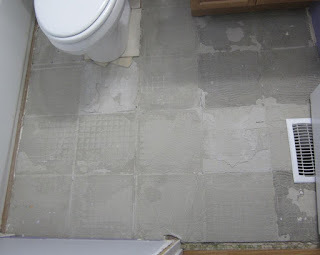 On June 14, I (almost) finished removing the tile floor in the bathroom. I've been working on this project in stages for a a while. 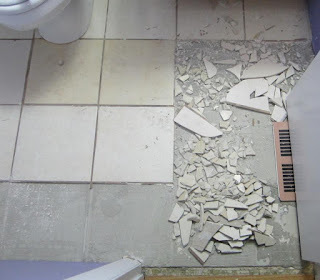 The floor was a perfect example of how not to lay a tile floor. 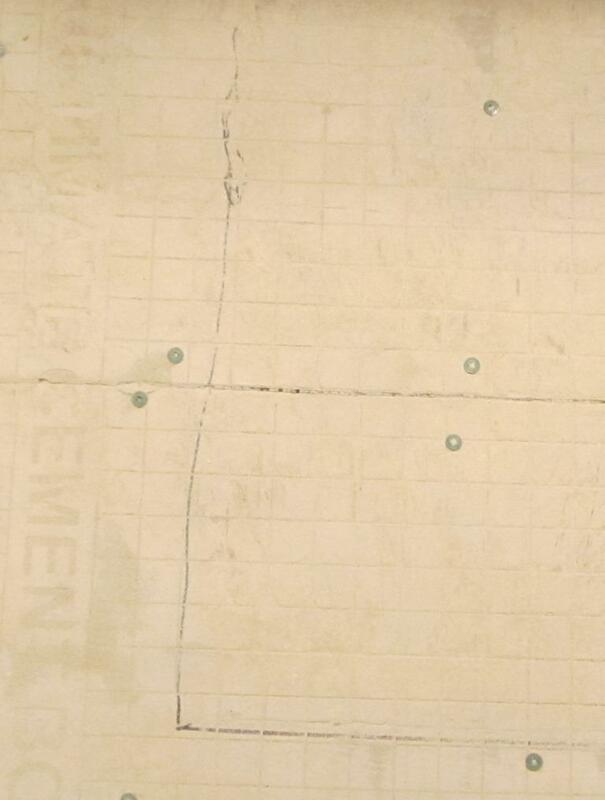 The tiles were not level, providing some sharp raised corners to trip over. 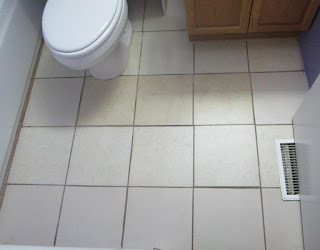 The tiles weren't lined up properly, so the grout lines were crooked. Worst of all, they didn't plan the layout well. There was a big gap alongside the tub; they filled it with grout. That's the brown line on the left side of the picture. With the tiles gone, I was left with the thinset/mortar/whatever the heck they used to set the tiles. For unknown reasons, there were two or three different types of thinset. You can see in the photo below that most of it is a sand color and was applied with a small-notch trowel. 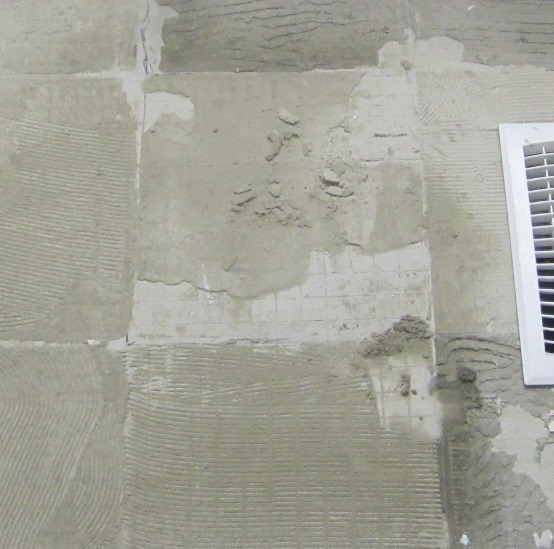 But in the upper and lower right part of the picture, it's a darker color and was applied with a larger notch trowel. Some of it scraped off easily. Some of it did not. 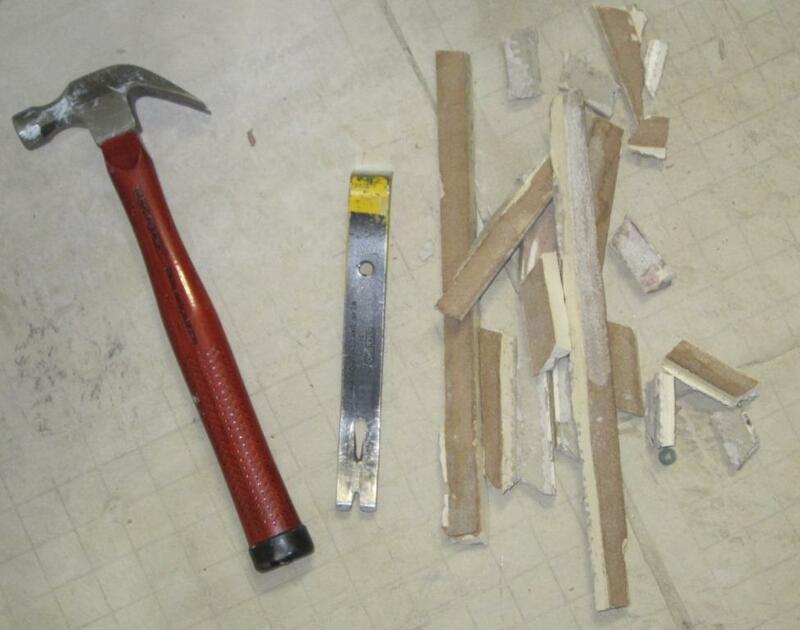 After briefly laboring with a hammer and chisel, I called in reinforcements in the form of a carbide grout remover blade for my oscillating tool. I love power tools. All that remained was the ridiculously wide strip of grout alongside the tub. I was a bit worried that I wouldn't be able to remove it without scratching the tub. But I was able to pop it loose in large pieces with my hammer and mini pry bar. 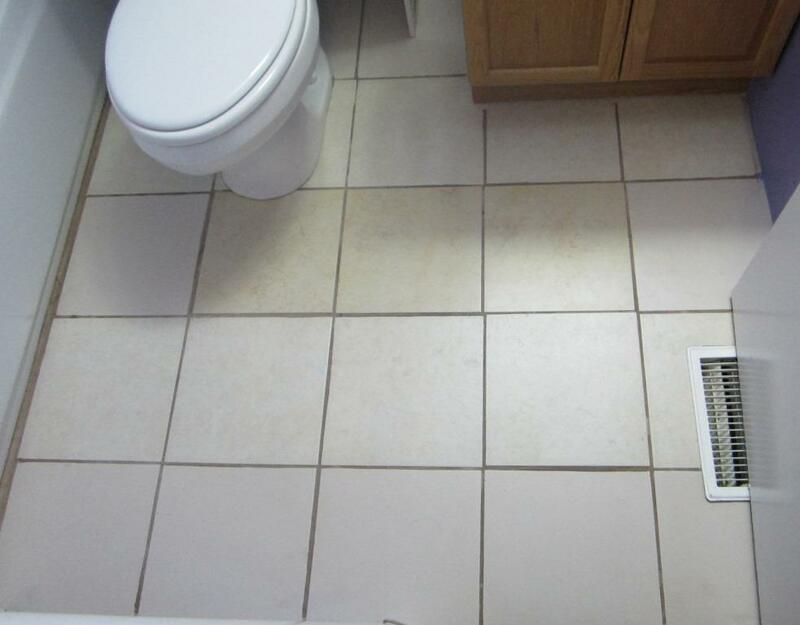 There are still two tiles left under the toilet. Obviously the toilet will have to be taken off before I can remove those. Then the new floor will be laid and the new toilet installed. As the house only has one bathroom, that operation will have to carefully planned. 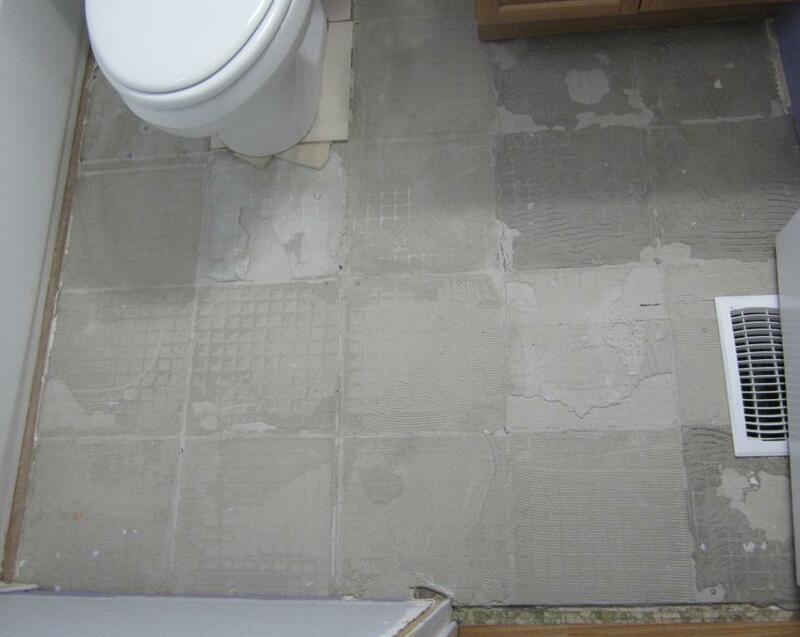 Terrible tile floor removed... (almost) Done! What in the world! This reminds me of my office at work. When I moved to that office, there were three shades of beige on the wall. When I moved a bookcase they had simply painted around the shelving. Weird. 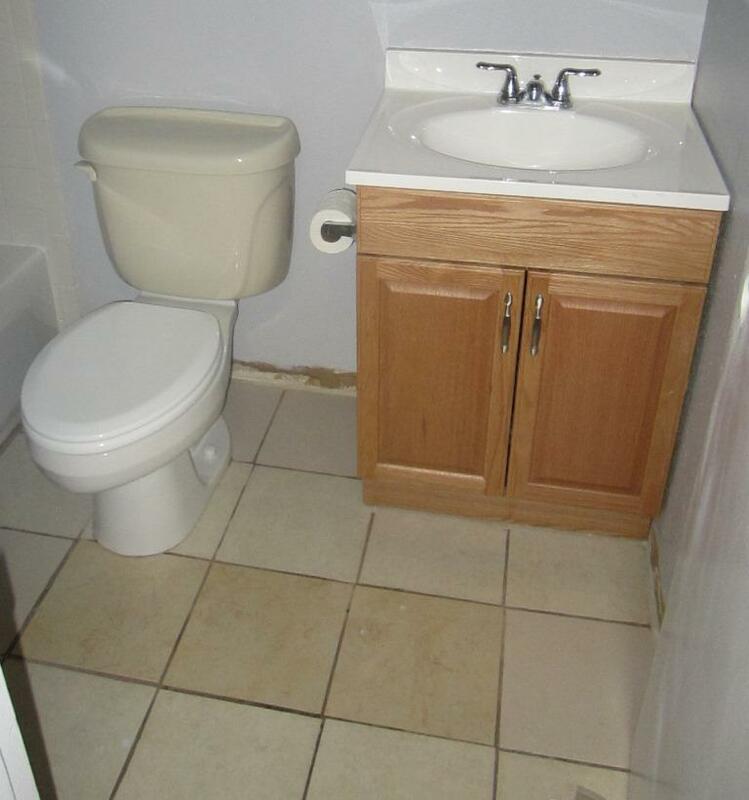 I can't get over the two tone toilet. Maybe it was cheaper?!? My father is turning in his grave! *shudder* It's called a ruler, people. Straight lines. UGH. No kidding. Those lines look they were drawn by a drunk monkey. HAHAHAHA! Drunk Monkey ... you're drunk, go home! Sometimes what other people call design is mere chaos and stupidity. Good of you to get rid of that mess! Yeah, it's astonishing what some people consider a home "improvement." Sometimes, going the cheap route isn't always a good decision. Ha ha! Yeah, it's hard to believe a sober person could do such a poor job. Here's the insane part... the husband was supposedly in the construction business. Maybe he used leftovers from other jobs. Oh, that's awful!! What a disgrace to construction workers everywhere! You're probably right about the leftovers, perhaps he wanted to be economical; either that, or he was trying to be creative. Serious FAIL on both. 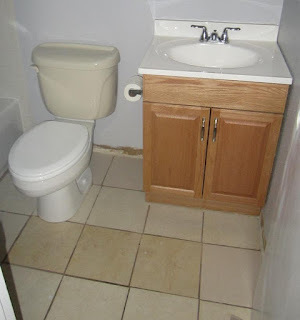 lol I live in a rental and this is exactly how crappily my bathroom was put together. It's just a mash up of second hand supplies that were already damaged and none of which coordinated. Everything was poorly installed and misaligned, but this is because the landlords are cheap and won't pay professionals to do it, they just get people off the street. I'm all for saving money or even shopping secondhand, but some people take it too far. The local reuse store has boxes and boxes of tile. 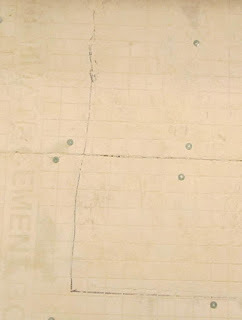 They could easily have bought 25 undamaged, matching tiles for about 20 cents each. I hate seeing sloppy work. I guess I'm old-fashioned, but I think if you're going to do something, you should try to do your best. Those mini prybars are my jam. They're awesome. Aside from scissors, they're probably my favorite non-power tool. I had a similar (though reversed) experience with black towels. They looked nice, but they left black lint all over the white fixtures. I guess the key is to have your cleaning gear and your fixtures be the same color. I'll be getting a white toilet. The shower tile is white and the new sink I picked out is white... so it makes sense to stick with white. The previous owners of this house are a trip, I'm sorry you've gotten stuck fixing their silly mistakes but it does make for a fun read! A lot of work, but so worth it!